A 35-year-old Tibetan nun named Palden Choetso set herself on fire on a street corner in southwest China last November. The final moments of her life were captured by an amateur video camera. As bright orange flames engulfed her body, Choetso stood impossibly still until finally she dropped to her knees and toppled over. Choetso is one of 49 Tibetans, ages 17 to 44, who have set themselves on fire since 2009 to protest repression in Tibet by Chinese authorities. The latest was on Monday, when two young men in their early 20s—one a monk—did so in a Tibetan region of China’s Sichuan province. 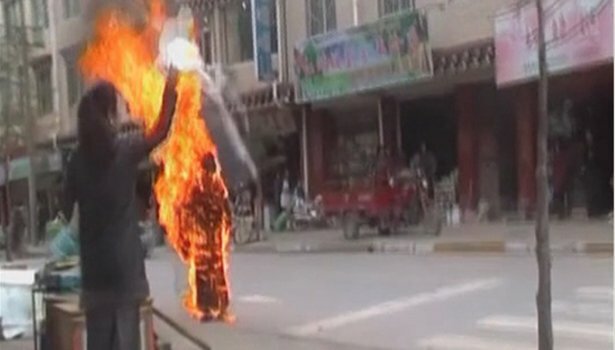 This spate of self-immolations among Tibetans is unprecedented. With China not changing its policies denying true religious freedom and civil liberties to Tibetans, the self-immolations are likely to continue. This presents an uneasy quandary for Buddhists, who consider the taking of life, including suicide, taboo. Without a doubt, Tibetans grieve over the self-immolations. No one I talked to wanted them to continue. But some reconcile the acts with their Buddhist beliefs because they are meant to serve a worthy cause, not to harm others. Buddhist teachings provide a few examples of self-sacrifice. In the Jataka Tales, a collection of hundreds of Aesop-like homilies, one story tells of Buddha’s self-sacrifice while incarnated as a hare. To feed a guest, Buddha offers his own flesh, even shaking off his fur to save any insects in his coat from death. “Then offering his whole body as a free gift he sprang up, and like a royal swan alighting on a cluster of lotuses, in an ecstasy of joy he fell on the heap of live coals,” the story reads. Ultimately Buddha in hare form is saved from being burned when the coals under him fail to light. In another familiar fable, Buddha encounters a starving tigress and offers his body as food so she can save her cubs. But these tales are just stories. The aftermath of a self-immolation in Tibet is brutal, whether or not it results in suicide. Survivors endure excruciating burns and are detained by Chinese authorities. Relatives and friends thought to be conspirators are also detained, arrested or jailed. Are self-immolations still acceptable? “They do it out of pure motivation for the well-being of six million Tibetans,” said Geshe Kalsang Damdul, assistant director of the Institute of Buddhist Dialectics here in Dharamsala, the exile home of the Dalai Lama. (A geshe degree is the highest level of scholarship in Tibetan Buddhism.) Suicide “without specific purpose, out of frustration with your life—that is definitely killing and not good,” he added. Most Tibetan religious leaders have not explicitly discouraged the acts, including Kirti Rinpoche, the exiled head abbot of Kirti Monastery. Kirti’s monastery in Sichuan has been at the heart of the recent protests, with at least 18 of its current or former monks having self-immolated. The Dalai Lama says that only the Chinese government can stop the self-immolations by lifting its repressive policies in Tibet. In an interview with CNN this spring, he declined to comment when asked about the self-immolations, saying the issue was “very difficult.” In other interviews he has called the self-immolators “courageous” but questioned whether the suicides have any impact. Still, other champions of the Tibetan cause are beginning to seriously question the tactic. The Karmapa, the highly respected head of one school of Tibetan Buddhism and a possible successor to the Dalai Lama, is one. Ms. Yee is a journalist based in New Delhi.